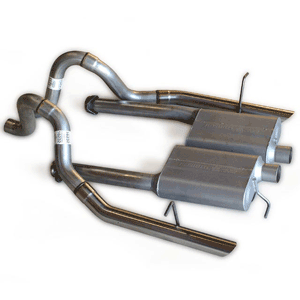 Flowmaster catback exhaust system for 1998 Ford Mustang GT/Cobra 4.6L features a 2.5 inch outlet, 40 Series Delta Flow mufflers, stainless OEM style exhaust tips. No one else gives you the bold clean styling of our Aftermarket Dress Ups, Suspension and Performance Parts for your American Muscle Car like UPR Products! Fits these Vehicles: 1998 GT V8 Mustang Roush & Saleen Vehicles.